The Real Women Project has been the nucleus for incredibly gifted talent to come together to share their work and inspire new projects. All of the artists represented below are well respected and accomplished in their careers and have dedicated and donated much time, energy and soul into the spirit of furthering the outreach and ability for us to touch many individuals from around the world. The songs, the lyrics, the voices, the poetry, the sculptures, the photography and the women are truly remarkable. The Real Women Project is blessed and proud to work with such gifted artists. T.J. Dixon is a well-known figurative sculptor who resides in the North County of San Diego, California. She became a free-lance artist in 1980 and hasn't stopped since. She is best known around the country for her countless public commissions. "I present to you a small sampling of beautiful women as I have experienced them; hopefully, in turn, offering each of us a chance to experience ourselves as beautiful as well". When River Malcolm first encountered the sculptures of 13 women's bodies; she was inspired to write a poem to each woman. These are now an essential part of the Real Women Project. River Malcolm is a writer and psychotherapist in private practice. "Working on the Real Women Project has taught me to actively search for the beauty that is inherent in every woman. Such beauty is not simply a static quality, but an energy that invites active engagement, learning to look through the eyes with love". Jan Phillips is the author of four books including co-authoring A Waist is a terrible thing to Mind - A Wake up Call. Jan has produced video programs for numerous national organizations including the development of those for the RWP. Her work and writing have appeared internationally. Jan's commitment to spiritual healing and social justice resonates in her work, which is evident in her workshops, her writing and the many other gifted creative outlets she has. Jan's input and tireless amount of travel throughout the country to share the message and mission of The Real Women Project have been at the root of the Project's growth. Visit her website at www. JanPhillips.com. Deborah Liv Johnson is an award winning singer/songwriter with a total of seven CD's to her credit. Graduating with a degree in creative writing from St.Olaf college, Deborah moved to San Diego to continue her music career. Image-rich lyrics and well-crafted melodies became her trademark. Her performances consistently sellout as she tours the country extensively and has been featured and revered by many national TV and radio stations. Deborah Liv produced A Mountain We Will Climb a CD single written for breast cancer survivor and mountaineer Laura Evans, and Real Women, Real Beauty, a CD honoring, celebrating and inspiring women. Proceeds from the CD sales benefit the Athena Foundation as well as the Expedition Inspiration Fund for Breast Cancer Research. Deborah is a singer, songwriter and President of her own recording label Mojave Sun Records. An accomplished entrepreneur she continues to support other musicians with their projects. "I love the idea of promoting self-healing through the arts. I have always been keenly interested in promoting women's health, as well as raising money for breast cancer research. The Real Women project really struck a cord with me"
Visit her website at DeborahLivJohnson.com. 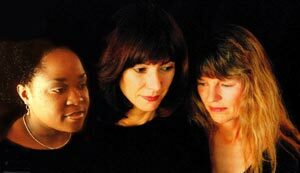 Time for Us Now is a compilation of 13 songs Featuring San Diego artists Robin Adler, Gayle St. Gregory and Tina Wilson. Collectively their styles range from jazz, blues and show tunes to gospel, contemporary pop and R&B. Each singer brings her own distinctive sound to the group which reflects the diversity embraced by the Real Women project. In 1998, Robin Adler released her first solo jazz CD "Its About Time" and has been winning the praise of numerous critics and prompting jazz radio stations from San Diego to New York to request live interviews. Robin is a traveler and adventurer by nature with a lifelong love of music and it shows. Gayle St.Gregory has been entertaining since she was four years old. She has headlined at major venues around the world and continues to write songs for companies in between her live performances and her music writing. Tina Wilson has appeared at the Gospel Music Workshop of America and has performed to three standing room only audiences at the House of Blues in Los Angeles. Tina recently released her first solo project "Yet I Will Praise Him"
Dave Blackburn is a producer, recording engineer, arranger, and composer. He is co-owner of Righteous Ride Records with his wife- Robin Adler. Incredibly gifted as a performer he also writes and composes a broad range of music. The Real Women Project's Time for Us Now showcases eight Blackburn originals. For purchase information and to hear samples from Time For Us Now click here. Real Stories is 2-Disc CD set features 21 original stories and poems read by the incomparable storyteller Alyce Smith Cooper. These stories are excerpts from the cutting edge anthology A Waist is A Terrible Thing to Mind , which will inspire, expand your thinking and touch your heart. As an Ancestral Storyteller, Certified Psychodramatist and Actor, Alyce Smith-Cooper has received numerous major awards. She has worked in both stage and film and is currently the host of a cable talk show. She has performed in numerous prestigious San Diego Venues that include The Old Globe Theater, La Jolla Playhouse and the Lyceum. Alyce is a registered nurse (R.N. ), with a specialty in psychiatric nursing, and a Masters (MA) in Human Behavior. An Ordained Minister, she is staff Chaplain at Scripps Memorial Hospital. For purchase information and to hear samples from Real Stories click here. Christine Forester is the co-author of A Waist is a Terrible thing to Mind which is a dramatic illustration of the profound impact of body image on women's lives. She is also the co-partner and Site Designer of BreakthroughPress. Born, raised and educated in the French part of Switzerland, Christine came to the United States in 1964 after completing a thesis in hospital architecture and receiving her Diplome d'Architecte. In 1981 she started Christine Forester, Catalyst which she continues today. For purchase information about A Waist is a terrible thing to mind click here. Karla Kirkwood is a three-time area Emmy Award winner for her writing and directing for KPBS-TV, the PBS affiliate in San Diego, and received national acclaim for numerous projects. She is currently the visionary and playwright of a creative piece in progress for the Real Women project. Her published works include the text of MWI (Many Women Involved) in Critical Condition: Women on the Edge of Violence edited by Amy Sholder (City Lights Books), Laying me Down in Uncontrollable Bodies and her English translation of Chinese playwright Gao Xingjian's, Che Zhan (Bus stop) in the Modern International Drama Journal.